The All Groups CPI rose by 0.4 per cent compared with a fall of 0.2 per cent in the March-quarter 2016. 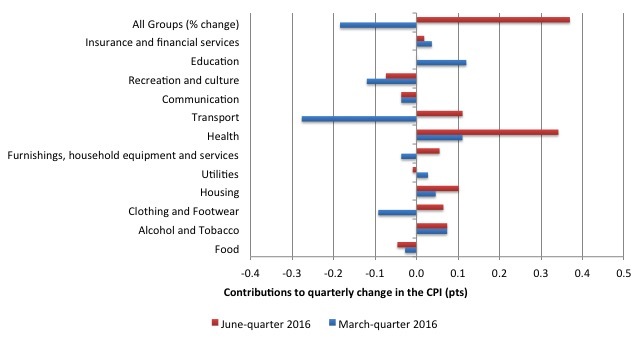 The All Groups CPI rose by 1.0 per cent over the 12 months to the June_quarter 2016, compared to the annualised rise of 1.3 per cent over the 12 months to March-quarter 2016. The Trimmed mean series rose by 0.5 per cent in the June-quarter 2016 (0.2 per cent in the March-quarter 2016) and by 1.7 per cent over the previous year (1.7 per cent for the 12 months to March-quarter 2016). The Weighted median series rose by 0.4 per cent in the June_quarter 2016 (0.1 per cent in the March-quarter 2016) and by 1.3 per cent over the previous year (1.3 per cent for the 12 months to the March-quarter 2016). The most significant price rises this quarter are medical and hospital services (+4.2 per cent), automotive fuel (+5.9 per cent), tobacco (+2.1 per cent) and new dwelling purchase by owner-occupiers (+0.9 per cent). The most significant offsetting price falls this quarter are domestic holiday travel and accommodation (-3.7 per cent), motor vehicles (-1.3 per cent) and telecommunication equipment and services (-1.5 per cent). The RBA may interpret the continuing weakness in the inflation data as a further sign that the economy is in trouble. 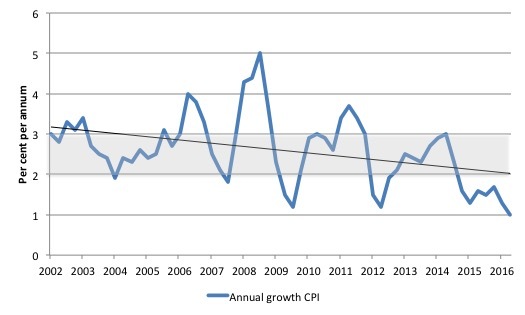 What is apparent from yesterday’s inflation figures and the most recent labour market data (see blog – Australian labour market – stagnating due to lack of overall spending – is that there is plenty of room for further fiscal stimulus. How to align that reality with the political narratives from both sides of politics which is running the exact opposite line is the question. The headline inflation rate increased by 0.4 per cent in the June_quarter 2016 translating into an annualised increase of 1.0 per cent, down from 1.3 per cent in the March_quarter 2015. This follows the negative inflation rate in the March_quarter of 0.3 per cent. Is a headline rate of CPI at 0.4 per cent for the June_quarter 2016 (1 per cent for the year) significant for monetary policy decisions? To examine its lasting significance we have to dig deeper and sort out underlying structural inflation pressures and ephemeral price factors. 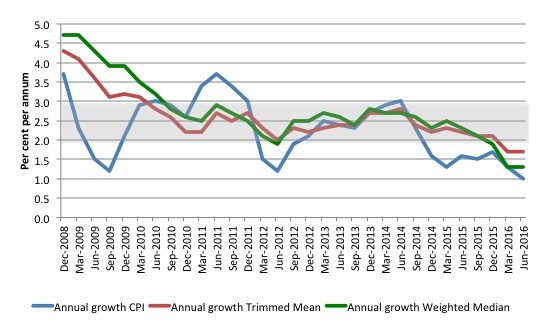 The CPI measure of inflation (falling to 1.0 per cent) has been well below the RBAs target band for the last two years. The RBAs preferred measures – the Trimmed Mean (1.7 per cent and stable) and the Weighted Median (1.3 per cent and stable) – are also well below the lower bound of the RBAs targetting range of 2 to 3 per cent. The following bar chart compares the contributions to the quarterly change in the CPI for the June_quarter 2016 (red bars) compared to the March_quarter 2015 (blue bars). The most significant price rises this quarter are medical and hospital services (+4.2%), automotive fuel (+5.9%), tobacco (+2.1%) and new dwelling purchase by owner-occupiers (+0.9%). The most significant offsetting price falls this quarter are domestic holiday travel and accommodation (-3.7%), motor vehicles (-1.3%) and telecommunication equipment and services (-1.5%). Our system of compulsory PHI, which was introduced by the conservative government during the 1990s was a blatant strategy to guarantee the profits of the private health fund providers. Many would have failed without the forced subsidy. They then abuse that compulsion on an annual basis by pushing up premiums well beyond the inflation rate – it is a scandal – especially in the context of our excellent national public health service. In the twelve months to March 2016, the major drivers of inflation were Health, Housing, and Alcohol and Tobacco Prices. The tobacco and health price rises largely reflect government policy changes. In my blog yesterday – The Bank of Japan needs to bring in Overt Monetary Financing next – I provided further evidence that massive expansion in bank reserves (central bank money) do not push up inflationary expectations. The following graph shows four measures of expected inflation expectations produced by the RBA – Inflation Expectations – G3 – from the June-quarter 2005 to the June-quarter 2016. The most reliable measure – the Break-even 10-year inflation rate – is now at 1.6 per cent, well below the lower bound of the RBA targetting range. It has falling rapidly towards the actual inflation rate in the last few quarters, reflecting the weak state of the Australian economy. 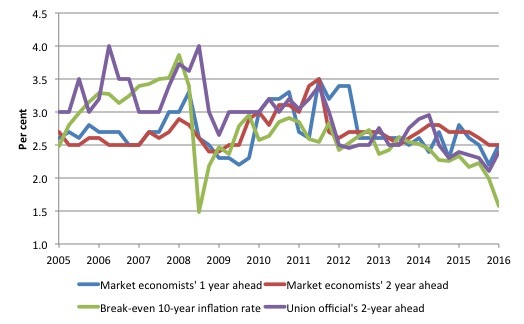 Australia is now a member of the low-inflation/deflationary brigade as a result of our austerity-obsessed national government which is dominated by neo-liberal Groupthink. I should add the Labor Opposition are part of this Groupthink. 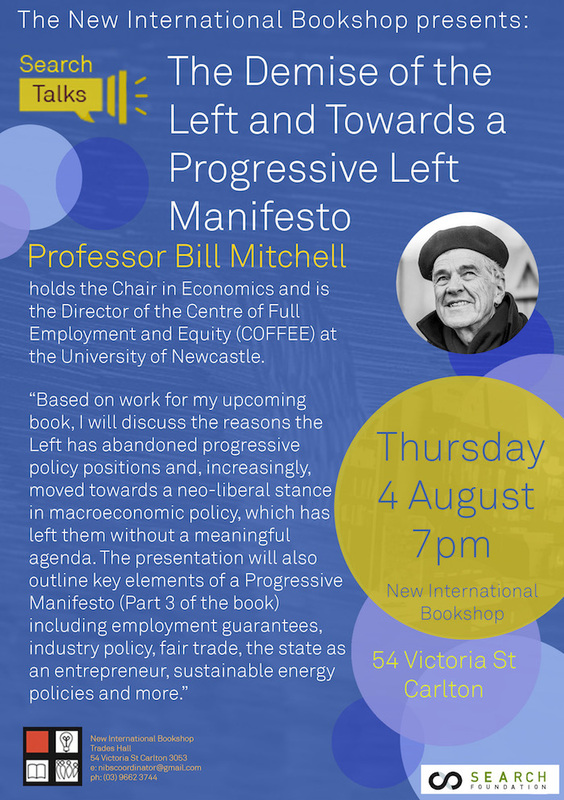 SO my criticism is really about the convergence of the major political parties to the flawed neo-liberal position. Looks like mortgage debt is cooling off, should do a pool on when the cash rate will hit zero.